This is a summary of the language learning community I have been welcomed into on Teachers Pay Teachers. Some schools will have one or two languages on the curriculum. Others will be seeking trained teachers in languages, but be unable to attract a teacher for the moment. My first teaching job was in a regional town. I took the position after no one had filled the vacancy in the previous 4 years. It was excited about the challenge straight after university. The town was welcoming but it was a challenge to lift all students with a four year gap in their Italian knowledge towards year level standard for 5 – 12 year olds. 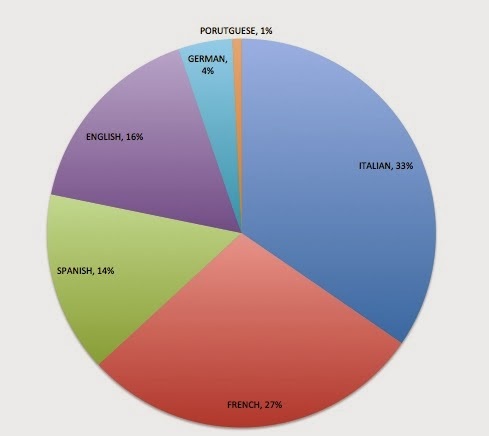 · These languages are then followed by Spanish, German and Portuguese. · Customers have bought 60 different products from my store. · The biggest range is the Italian range of 34 different products. · Followed by French, Spanish, German and Portuguese in descending order. Making products in more languages reaches students in more schools. · Action: I create resources in Italian and French, and for the growing need for similar resources to support school learning other languages. · Action: I create a range of numbers resources across languages to support from 1-10, 1-30 and 1-100. · Action: I create colour coded vocabulary and sentence building to support gender and number patterns in nouns and highlight the roles of verbs and nouns. · Action: I create a bundle of activities that are useful with any text. You can adapt it to any text and use the graphic organisers to help students interact and respond to the text. One example is newspaper reading comprehension activities. I am amazed with how much support there already is in the TpT community from my fellow teachers. If you are a langauges teacher looking to start your own TpT store, try to make a variety of resources. If you know more than one language to increase your reach to more students dramatically, If you are artistic, many teachers like to buy bright and colourful resources with illustrations particularly for primary school children. If you are not so artistic, make space in your resources for students to have the opportunity to draw their own. Students who make their own connections will remember more of the work throughout the unit. Most useful type of teacher created resource? Happy Teaching and Learning Languages!